An estimated 9,000 real estate owned (REO) property resales occurred in the third quarter of 2013 (Q3 2013). That’s less than half the number of REO resales one year ago. Unsurprisingly, this translates into a sharp drop in the REO market share. 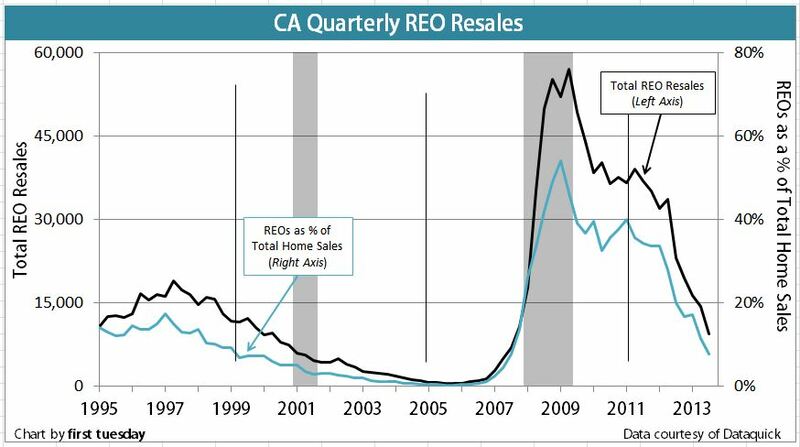 REO resales accounted for 7.7% of all California resale activity in Q3 2013, down from 20% one year ago. Potentially, this is great news, as REO resales make up around 7% of resales in a healthy market. However, this low share is slightly misleading and may not continue in the coming quarters. The abnormally high speculator presence experienced thus far in 2013 has blown home prices sky-high, in most places 20% higher or more than a year earlier. Rising prices in turn have buoyed many formerly underwater homeowners into solvency, decreasing the number of homes going to foreclosure for lack of equity. As speculators exit the market (and they have already begun to leave) and prices level off, expect REO resales to rise slightly in 2014. See our latest analysis of the distressed market conditions [here]. The above chart tracks the number of California residential properties resold quarterly by lenders who acquire ownership by foreclosure. These properties are also commonly called “Real Estate Owned” properties (REOs). REO resales rise and fall as a function of economic well-being based on multiple factors, including the employment status and wealth of homeowners, FRM rates, ARM financing, lender solvency and efficiency, and the price of homes. Lately lenders have become more inclined to grant short sales, causing foreclosures (and thus REO resales) to fall. Still, the inventory of REOs on the market remains around four times higher than normal. REO sales will continue to be driven by the wave of foreclosures that heralded the recently-ended Great Recession. As the chart above indicates, a significant percentage (just below 40%) of all homes sold since 2008 have been REOs. The ratio of REO sales to total sales ordinarily rests at approximately 7%, as was the case in 1999. However, as the job market begins to recover and lenders regain solvency, the number of NODs and Trustees deeds is expected to remain strong, if not rise, well into 2014. It will then head for an equilibrium rate of below 10% REOs of all sales in the MLS marketplace, most likely in the 2017 period. Excessive real estate owned properties (REOs) are welcomed by speculators (the opportunists in a momentum real estate market), since only speculators have cash reserves for the liquidity (read: fast sale) required by lenders in their time of financial crisis. Motivated by fear and desperation, lenders have proven willing to take enormous price cuts in exchange for cash in hand.On the other hand, REOshave been disastrous for homeowners trying to sell or refinance. The influx of REOs depresses home prices, and prolongs the intensity and length of the recession before a recovery can begin. REOs will continue to burden the market well into 2016. REOs tend to sell quickly and at a lower price than other real estate, once the lender-owner gets realistic about a property’s value. In this turn of the recessionary cycle, lenders are beginning to realize that idle real estate is costly to them since property deteriorates in quality and depreciates in value due to neglect and time. 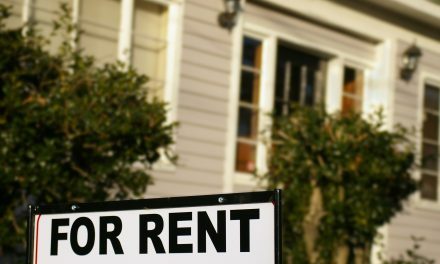 Unfortunately, homebuyers looking to purchase a principal residence do not often benefit from REO resales. Instead, REOs are most often sold to real estate speculators with plentiful cash on hand. Speculators seek to hold property briefly and, in the case of contractors, undertake basic repairs before putting it back on the market at a higher listing price. Only then is the homebuyer first able to purchase the property in a normal transaction, which requires time to find a lender willing to provide purchase-assist financing. property stalled in the current eight-month foreclosure delay between the notice of default (NOD) and the trustee’s sale. The shadow inventory is a constant reminder to real estate professionals that the housing market still has a way to go before it normalizes, probably in 2016 when sales volume will have picked up significantly – followed by increased prices. The first step to diminishing this shadow inventory and bringing the market out of real estate limbo will require jobs and resolution for the extensive quantity of negative equity properties. The market will only recover when the REOs and potential REO properties are eventually resold to end users: owner-occupants or buy-to-let investors, not speculators. Speculators do not help the real estate market recover during recessions, but do provide troubled lenders with cash during a liquidity crisis. Contractors acquiring and renovating homes to meet a homebuyer’s requirements are accomplishing a useful value-adding activity. This behavior is becoming increasingly common; at this point, contractors may be paying too much for properties to renovate and resell them during the 2013-2014 period at a profit. With such a variety of institutions holding REOs, using different methods to price and report their foreclosed home holdings, it is difficult to ferret out the exact number of REOs that remain to be placed on the market. The shadow inventory is thus a wildcard. 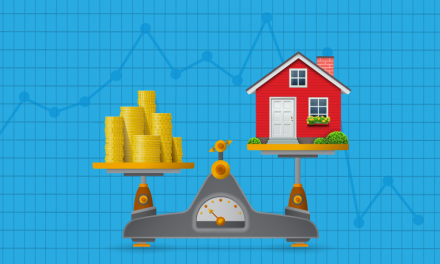 It creates a quandary for brokers and agents looking forward to the day real estate prices finally stabilize then begin their annual upward rise in sales volume and prices. *Numbers from 3Q 2010 onward are estimates of REO resales based on existing data from DataQuick tracking REOs as a percentage of the state resale market. 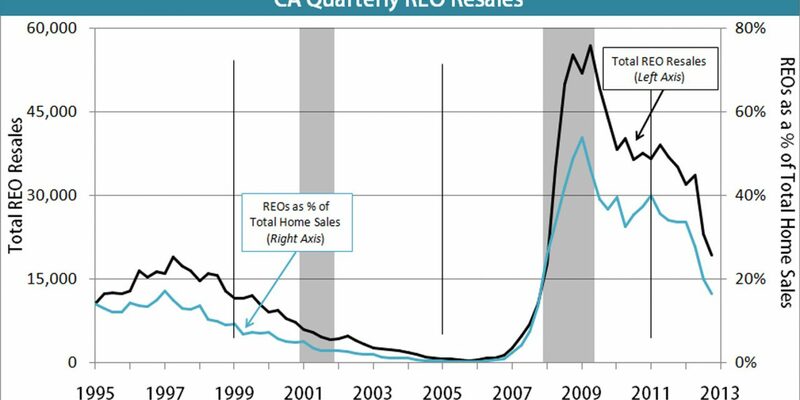 All earlier numbers are actual recorded REO resale numbers for California. PreviousIs a lender required to offer a permanent loan modification to a HAMP borrower who successfully completes a trial period plan? NextIs a buyer eligible for the first-time homebuyer’s tax credit when purchasing property indirectly from their parents?